When I worked for the Sunday Telegraph I was lucky enough to be set to some far flung and interesting locations. At that time it was far more common place for photographers to be sent by newspapers to far flung corners of the world to record the stories of the day. With circulation of newspapers in free-fall it does not happen on anything like the scale it did. It gave me some of the most unique and special moments of my life. Being a photojournalist is having a 'passport' into other peoples lives, in sometimes challenging situations, giving you an insight which can be challenging to put into photographs. Often what made the journey special was the people I would meet. In the late 1990's I was sent with reporter Adam Nicolson (a great writer and good company, a rare combination in journalists) to Newfoundland to report on the highly emotive seal cull/hunt. We were guests of the Fisheries department of the Canadian government, who rather predictably played everything 'by the book' and would not let us anywhere near the seal cull, too difficult to get to and dangerous.....feelings running high....so the line went. Indeed we needed a permit from the Canadian government -which we did not have, for good reason. Some years earlier an image by Kent Gavin of the Daily Mirror of a young seal pup being clubbed to death on the ice caused widespread international outrage and a major headache for the Canadian government. Our government minder did not want a repeat of this episode. We could however meet some 'sealers' at a diner and get their perspective. There is little more frustrating for any news photographer than having to sit through an interview having travelled half way around the world knowing that your photos are never going to match all the interesting stuff being said. We met the two sealing representatives who were telling us how they were being unfairly portrayed and how the media had it wrong and how the seal hunt was just part of their seasonal rotational harvesting of the sea, depending on what there was to catch at that time of the year. Snow crabs, Cod (before they were fished to extinction on the Grand Banks) and the Harp seals. I went to get a coffee from the counter, leaving the journalist and the government minder talking to the other sealer and was joined by the most vocal and eloquent of the sealers a guy called Gary Troake. I said I would like to but we needed a permit, we had no clue where the seal hunt was and we did not have an idea how to go out onto the ice. I passed the journalist a note telling him of my plan. There was after all one minder and two journalists so there was little he could do when I headed out into the parking lot and into Gary's car. As we drove away from the diner I knew I was going to have and adventure but I was not ready for the kindness and generosity showed to me by Gary his wife Suzanne and his young family. We had to wait for the weather to come right before we could go out on the ice. They put me up in their spare room in their small house for several days. Giving me a valuable opportunity to document life in the community. It gave an amazing insight into sealing but more importantly Gary's conservation views (well worth a read) which were pretty illuminating and learned. One of the thing I did learn a lot about as a photojournalist was grey areas. The world is full of them. Just because Gary hunted seals it did not mean that he did not have a lot of sound knowledge and big ideas for conservation, some which were not always universally welcomed in the sealing community. I think I was there 3 days until the weather was right. Crystal clear blue skies with no wind. Cold is a word which took on new meaning. They asked if I had good cold weather clothing and I confidently replied that I had, fleece and gortex layers galore. In moments of being in the harbour I realised the clothes I was wearing was next to useless, the cold cut right through me. They gave me a thick insulated survival suit, think of a babies romper suit made from hot water tank lagging and you will not be far off. As we made our way out of the harbour the glass fibre hull of the boat cut though the ice making the most horrible juddering sound. I was told this is why they favour glass fibre over wood, as it cuts through the ice and holds up better against damage. Very little could prepare you for the sight once we were out of the harbour and into open waters. Just clear blue skies, oily deep blue water which went on forever punctuated by the occasional piece of ice which had broken off from the ice flow. Apart from the sound of the engine there was nothing, not a sound at all. A few hours in one of the men saw a seal and fired a single shot. 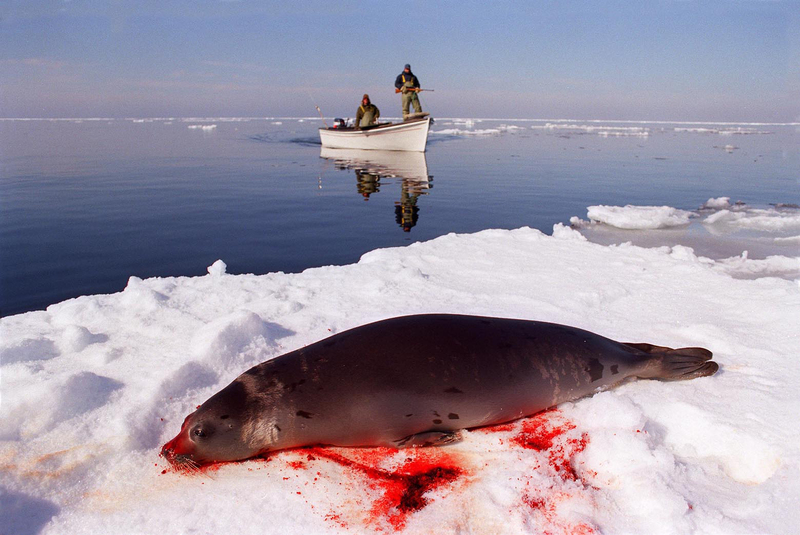 He had killed the first of three seals that would be shot by the sealers that day. I was not ready for it. Camera's packed away because I really was not sure how they, or the batteries would stand up to sustained exposure to cold. I was shooting with Canon EOS-1's and they did just fine but I had to manage my batteries. I have to admit I did not shoot roll after roll of images as changing film was a mission and so damn cold to boot. Just a matter of making every frame count. From the day there was one frame which worked really well. I was with one of the seal hunters on the ice who had just dragged the seal out of the water. The others thought that they had seen another seal so left us, giving me a this shot which gave a real sense of the vastness. The challenge was to tell a story often in one frame as this was frequently all a paper used to illustrate a story. Then to hope that they use it. How did I feel about going out with sealers who killed three of the most appealing mammals in my presence? One has to leave one's emotions and prejudice's at the door when covering news. But it was difficult to have any bad feelings for these guys and the community when they are just trying to hang onto life in one of the most challenging of places in the world. One thing that struck me was just how dangerous their relationship with the sea was in small open boats, wether sealing or fishing. A way of life that has claimed many lives in the small community of Twillingate. When researching this blog I read with great sadness that Gary Troake and Roger Blake's small boat capsized in the icy seas while retrieving their nets. Both men lost their lives. There are a lot of "grey's" in life. Which is why it is so farcical when people like Sir Paul fly in to proclaim a "truth" when they don't even know where Newfoundland is. I was not sure what kind of response I was going to get to this post. I was anticipating a hostile response from some quarters but infract I received nothing but positive comments, which I have been very pleasantly surprised by. Some people have ugly jobs. But this is an industry we have created and the only way the hunt will stop is if there is no demand for product. Yes the seals are cuddly and cute, but really, what's the difference between this and harvest of standard farm animals? The people doing the bitching should think of that the next time they eat a hamburger. The Canadian government regulates the activity. If populations are down, quotas will be lowered. THe government has the power to stop it if they want, but then they would have more poaching and that can be even worse, because many of those people have total disregard for anything. People want the sausage, but no one wants to see the sausage being made. An old friend who works in government here taught me that. I can well image your feeling / thinking when you wrote this. I am a Canadian and am culturally inclined not to make wave. Plus as a photographer, all I want to do is shoot, shoot, shoot. But every now and then I let slip and take a stand on something on-line. And then the apprehension sets in. What if I get swamped in a wave of hostile blowback? Only a few days ago I reacted to a post on Facebook about how someone was going to "blow the head off of anyone who touches" their kids. An American, of course. When I commented that it was only fair that if they made a mistake in the process, then someone should immediately "blow their head off, too", I cringed and waited. I probably shouldn't have been so nervous, I guess. I think in general the American's don't realize they have such a problem. In any case, I do understand you apprehension. And with the persistance of the Internet / your blog, you could still get some blowback in the years ahead. I'm still waiting to get some stick for it.